With Windows 10, Microsoft continues its switch from the old‐and‐weary world of desktop programs to the mobile‐friendly land of apps. After a year of updates, apps are more difficult to avoid than ever. Some people love apps. They’re designed for touchscreen tablets, as well as for phones, with limited screen real estate. They lack complicated menus and aim for touch‐friendly simplicity. Other people hate apps, preferring to run programs on their desktop. After all, they’ve been doing it that way with a mouse and keyboard for two decades. If you find Microsoft’s focus on apps to be misguided and annoying, here’s how to avoid them. Follow the tips in these sections to remove apps from the Start menu and your PC, keeping your focus on the desktop. Windows 10 stocks the Start menu’s right edge with app tiles. Windows 8 and 8.1 owners may be accustomed to Microsoft’s new app‐loving lifestyle, but apps may be new and unwanted for Windows 7 upgraders. Luckily, you can prune those tiles fairly easily. To remove a Start screen tile, right‐click it and, when the pop‐up menu appears, choose Unpin from Start. Repeat with all the other tiles until they’re gone, gone, gone. That removes the app tiles from the Start menu. But the apps still remain on the Start menu’s All Apps alphabetical list. And it doesn’t remove the apps from your PC. The Apps & Features window appears, listing your installed apps along its right side. To remove an app, click its name, click the Uninstall button that appears below its name. Then click Uninstall again when Windows asks whether you’re sure you want to delete the app. 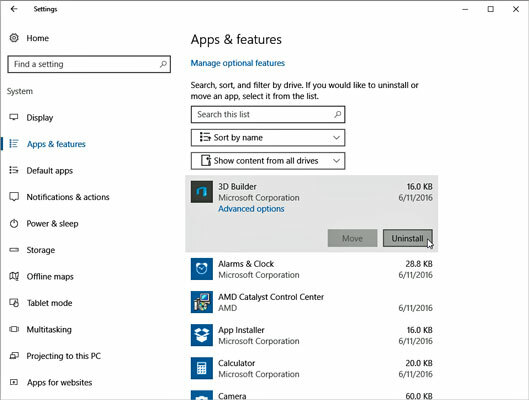 Windows deletes the app from your computer, removing it from the Start menu along the way. Not all apps can be deleted, unfortunately. If the Uninstall button is grayed out, that app can’t be uninstalled. To remove an app, click its name and click the Uninstall button. Some people don’t mind apps, as long as the apps don’t intrude on chores normally handled by their traditional desktop programs. But in Windows 10, apps often want to open your desktop files. Clicking a music file from the desktop’s File Explorer, for example, normally fetches the Groove Music app rather than Media Player, which has held the reins for years. Click the Start button and click the Settings icon from the Start menu. The Settings app appears. When the Settings app opens, click the System category and then click the Defaults Apps option from the left pane. The Choose Default Apps screen appears. For each type of file, choose the program that should open it. In the Music Player section, for example, click the currently listed program. When the Choose an App screen appears, showing apps and programs capable of playing music, choose the desktop player you want to handle the job. Repeat for other program categories until you’ve replaced any Start menu apps with their desktop equivalents.